Steelcase Campfire Big Lamp by Turnstone (TSCAMPLAMP) at Pure Design / Accessories / Lighting ::: Furniture for the Home, Office, Home Office, and More at Pure Design Online! The Campfire Big Lamp creates a space within a space, uses simple 100-watt incandescent lighting and invites people to step into the space and stay for awhile. It's not just about lighting (you probably have enough of that) it's about space definition. 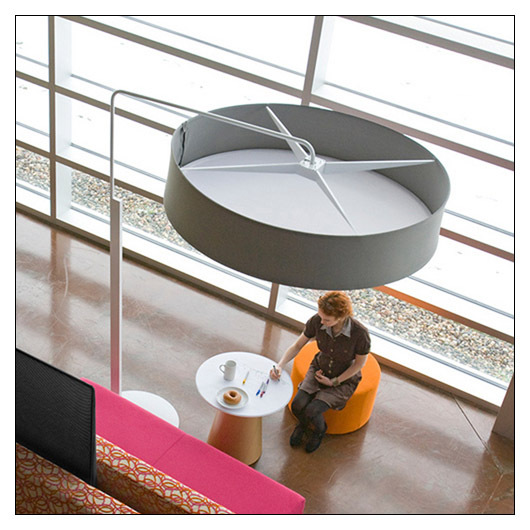 Like a beach umbrella that says "this is our spot," the big lamp helps to identify a smaller space within your larger office. Bottom of shade is 78"